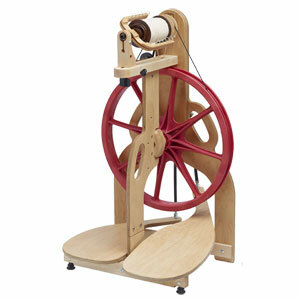 I am new to spinning and in the market to buy a wheel. Trying to choose a wheel is challenging as I have been reading and learning what characteristics are important. My confusion is with ratios: looking at the Ashford Kiwi 2, it says it has 5.5 and 7.25, which, if I understand this correctly, makes it a slow wheel that is good for spinning coarser wool. I would like to spin a variety of wool, but also alpaca-especially since I was given 2 processed fleece. Will this ratio work for alpaca? Will I need to adapt the wheel or get additional kits for the Kiwi 2? Are there other wheels I should look at with a broader ratio? You are correct that the Kiwi 2 is a slow wheel, but there are ways to speed it up; we recommend the Kiwi Hi-Speed Kit, found here. As a beginning spinner, you need to balance the ability to go slowly enough that you can actually learn on it with the scope to take you past the first month and on into the rest of your spinning life; the Kiwi speed kit will certainly help with that. Slower speeds are not precisely for spinning coarser wools, but rather for fatter yarns. The fiber is immaterial - it’s the diameter of the yarn that is affected by ratio. Skinnier yarns take more twist to keep them together than fat yarns do; given a steady treadling pace and a consistent drafting rate, you’ll need more twist to make a thin, sound yarn, and so will need a faster rate in order to keep making yarn at the same rate. Alpaca, because of its warmth, is usually spun finer than wool (otherwise, it’s unbearably hot); so it is spun at a faster speed in order to keep consistent body mechanics, i.e. drafting rate and treadling rate. There are many wheels with a broader scope than the Kiwi which also have the ability to slow down enough to be able to learn on them; the Lendrum Original is one of those. The Ashford Traditional and Traveller are also nice wheels with a lot of scope, as is the Schacht Ladybug. The Kromski Interlude and Sonata are possibilities, too. In general, the thing to do is to sit and treadle all the wheels that you are thinking about; the one whose action you fall in love with is the one to buy, whether you can spin on it yet or not. I have been spinning for about a year, and I am trying to teach myself supported long draw. The problem is that when I try to get started, the yarn feed onto the bobbin will separate from my leader or it will grab a large amount of fiber, creating large thick spots. What am I doing wrong? Tie a loop into the end of your leader, and if you put the end of your spinning fiber through a loop, it will usually be easier to get started. Go ahead and spin worsted for a few inches rather than starting right in with a long draw, or just hold and accumulate a lot more twist before releasing the pinch to allow twist in to the drafted fiber. Remember that a supported long draw lets in twist gradually from the hand in front repeatedly releasing the pinch to allow more twist in, and then pinching again so that you still have the ability to draft out your slubs (before too much twist gets added in); it’s a delicate back-and-forth. You may also have a little better control if you don’t run your arm out too far at the beginning, but go out gradually in steps as the twist is added. Lastly, the key to a uniform yarn is as perfect a prep as possible; you can’t get nice slub-free yarn from a funky prep, and there’s no substitute for a consistent rolag. In writing this, I realize that long-draw is a tough thing to verbalize; one of those cases where a picture (especially a video!) is worth a great many words. If you get a chance, Judith Mackenzie’s A Spinner’s Toolbox DVD is a good reference.